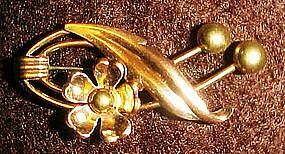 Pretty and dainty gold pin by van Dell. 12kt gold filled . elegant single flower wit leaf and tendrills.Measures 3/4" x 1 3/4". Excellent condition and is marked.